In Mexican Sicario means hitman, and this film will drop you like a bullet to the back of the head. The opening scene follows an FBI raid on a suburban home in Arizona. We are not told why the FBI have targeted the residence nor what their aim is, but we learn quick that Mexican drug cartels don’t operate exclusively from one side of the border, and more importantly, they will go to extreme lengths to protect their operations. It is a grisly, tense and harrowing sequence that ends with a quite literal bang. The sequence also introduces us to Kate (Emily Blunt) who following the conclusion of the raid is summoned to head office and requested to join a joint task force of sorts, with Matt (Josh Brolin) and Alejandro (Benicio Del Toro) the other members. There is precious little information as to what the task force aims to do beyond ‘get bad guys’ and throughout the remainder of the film we see through Kate’s fresh and often disbelieving eyes. Through the remainder of the film Kate sees danger and death at close range. She sees poverty and ill gotten wealth on both sides of the border. There is money laundering, drug mules, dirty cops murder and tunnels. The power of money and the depths of corruption. 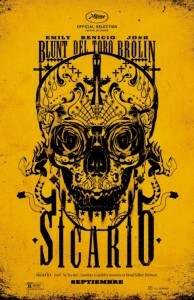 Sicario is a real eye opening film about the extreme nature of the drug war and how the odds are heavily tilted in the favour of the powerful and violent. If true, it pains a depressing picture of the future. If false, it is nonetheless a powerful and brilliantly executed drama, packed with taut sequences, intrigue and exceptional acting throughout. It is perhaps the best time you can have being sad about the state of the world in 2016. Final Rating – 8.5 / 10. Director Dennis Villeneuve has hit a fertile groove in a short period of time, with this film, Prisoners and the interesting – though flawed – Enemy. Let’s see what comes next.